So I'm a little late on this review. I know that many people like to give an album review the week it is released. I listen and re-listen to a new album dozens of times in the first month or so...especially if it's good. (I've only played the new Radiohead a few times--sorry Thom--it's not that good) Over the course of this time, I may like some songs more or less than I first thought. My first impression doesn't always hold. I remember a decade ago when Sum41 first hit the scene. This was in the heyday of young punkish bands flooding the market. The Offspring, Blink182, and others Warped Tour-esque bands flooded the airwaves. Sum41 only stuck out in my mind for their humorous videos. I thought their popularity was fleeting. Luckily, they proved me wrong. I thought their funny videos were their gimmick. Sum41 doesn't have a gimmick. Their gimmick is that their music is just downright good. 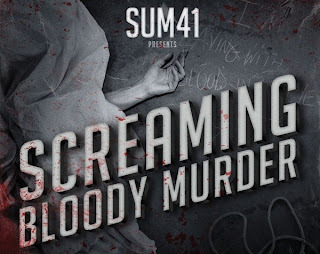 Sum41's new offering is titled Screaming Bloody Murder . This album comes after 2 solid showings in previous albums. (Chuck and Underclass Hero ) Chuck was like a breath of fresh air for me. Sum41 waded further from their punk sound and ventured into riffs reminiscent of Metallica, harmonies like the Beatles, and drum work to make Neil Pert jealous. Am I overstating this--probably. But it one of my favorite true rock/metal albums of the last 10 years. Underclass Hero slowed things down a bit, and brought back some punk feel. It is a great album, but not in the class of Chuck. (IMHO) Screaming Bloody Murder is much more "rock" than Underclass Hero. It starts off with a couple great songs in Reason to Believe and the title track. Screaming Bloody Murder is probably the best bet for broad appeal to play over the airwaves. Sum41 does a great job of varying rhythms, melodies, and mixing up the feel within each sound. They don't use an equation in each song. (verse1/chorus/verse2/chorus/bridge/chorus--fade to Hall and Oates in the shadows.) They effectively use harmonies, and the talent is truly evident in all of the instruments. Repeatability--Also a very high score. The album is getting better with each listen. Familiy-friendability--This scores on the lower end. While it doesn't approach the offensive-ness of say Lisa Lampanelli, it does have a song title Skumf*k.
Affordability--It's only $5.99 as a digital download on Amazon.com. What a freaking deal. You can also listen for free on Sum41.com. Lengthability--This is a good solid 14-song album. (unlike the recent Coldplay album. On viva la vida loca, If you take away the intro and outro song which are basically the same thing, you're left with 6-song single. When you pay full price for a short album, you've just been coldplayed.) Drop in the earbuds, and go mow the lawn. You'll be listening the whole time. Versatility--Also a high score. This album could be played in most circumstances--exercise, in the car, during a slow church sermon, and would do well in some form of Rockband video game. Sexuality--For those of you who listen to music during romantic episodes (whether that be with a partner or alone--I don't judge), this is probably not a good choice. I suggest some lighter listening. This is a very strong album that will be in my regular rotation. I would rank it right alongside Underclass Hero, but a little short of Chuck. 4 rocking stars.